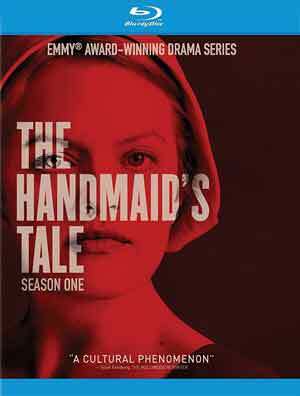 The Handmaid’s Tale is the story of life in the dystopia of Gilead, a totalitarian society in what was formerly the United States. Facing environment disasters and a plunging birthrate, Gilead is ruled by a twisted fundamentalism in its militarized “return to traditional values.” As one of the few remaining fertile women, Offred (ELISABETH MOSS) is Handmaid in the Commander’s household, belonging to the caste of women forced into sexual servitude as a last desperate attempt to repopulate the world. In this terrifying society, Offred must navigate between Commanders, their cruel Wives, domestic Marthas, and her fellow Handmaids – where anyone could be a spy for Gilead – with one goal: to survive and find the daughter who was taken from her. This 3-disc set is housed in a standard Blu-ray case. The only features included are Script to Screen and Hope in Gilead featurettes. Fox releases The Handmaid’s Tale onto Blu-ray presented with a 1.78 widescreen aspect ratio as it originally streamed on Hulu and given a 1080p high-definition transfer. The picture for the most part was sharp throughout and even though it takes place in a dystopian future, there are some pops of color such as the reds in some of the costumes. The show actually boasts a strong DTS-HD Master Audio 5.1 track both outputting great depth for the action-centric scenes including the series chase intro where the bass kicks on for extra measure as well as crisp and clear dialogue levels via the center channel. Overall, The Handmaid’s Tale is a well made adaptation of the classic novel which does a great job with character development and features some excellent performances from Elisabeth Moss and Yvonne Strahovski. This Blu-ray from Fox offers serviceable video and audio transfers while the bonus material was woefully weak, unfortunately.